Our Boat Test of the Fleming 58. 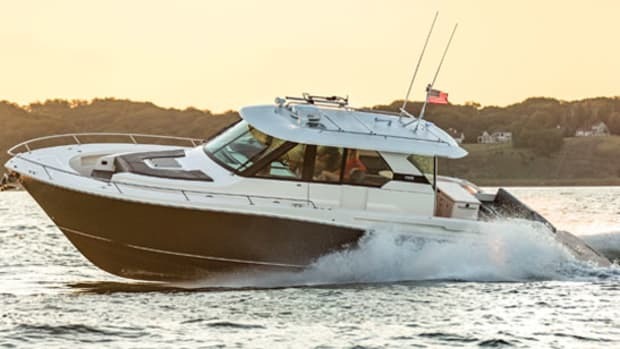 Thanks to a raft of top-shelf engineering details and more redundancies than you can shake a boathook at, the Fleming 58 is the real deal. On the right, just as you step through the door at the north end of the Sailfish Club of Florida, a Palm Beach haven for the salty and truly posh, there’s a very large, very old photograph of Ernest Hemingway and John Rybovich Jr., standing alongside each other, down in Cuba in the early 1950s. 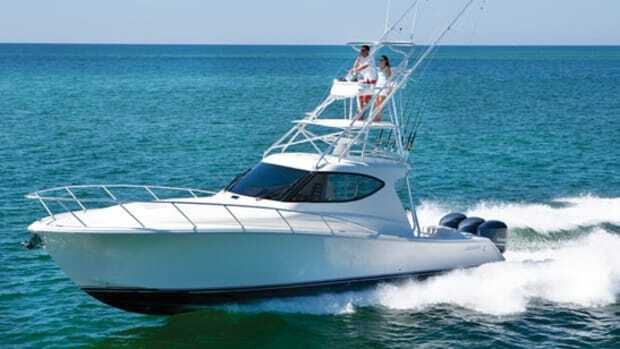 Hemingway is signing a trophy edition of The Old Man and the Sea, destined for a Palm Beach-based, Rybovich-affiliated sailfishing tournament. “Cheeseburger in paradise,” I chortle back, as charmed by the nautical décor as by Burkhardt’s authenticity. Heck, in shorts, deckshoes, and a short-sleeved knit shirt, he seems like something of a salty soul himself. Especially when you consider the depth of seafaring knowledge he’d been displaying all morning and the breezy way he’d just docked the Sharon Ann (his third Fleming), with little more than a couple of taps upon his dual-band Yacht Controller and a couple of bursts from the boat’s proportional, electric Side-Power thrusters. 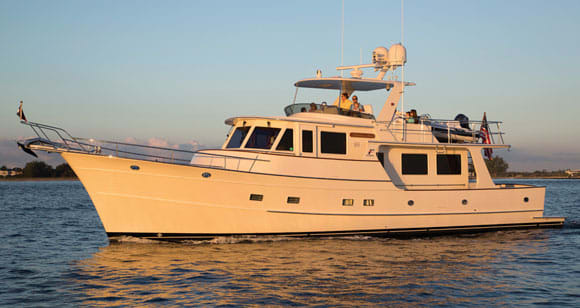 Of course, the Sharon Ann is perfect for a guy like Burkhardt. Much earlier in the day, while I’d helped him do pre-startup checks on the 800-horsepower MAN R6-800 diesels in her ER—an easy chore, thanks to inboard access points—he’d waxed poetic about a bunch of engineering biggies that were obviously near and dear, each one the hallmark of a fully marinized heart and mind. 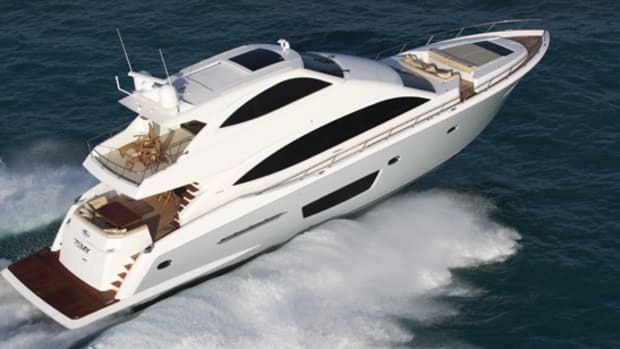 At the top of the list: the oil-filled Seatorque propshaft and thrust-bearing assemblies that emanate from the marine gears at the rear of each main engine. They improve speed and operating efficiency, Burkhardt had explained, by enclosing the propshafts in tubes, thereby nixing the drag that an openly rotating propshaft produces. And they cut noise and vibration on board, he’d added, by transferring propeller thrust from the engines to the structure of the boat itself, thereby making it possible to position the engines on soft, flexible, noise-and-vibration-isolating mounts. I’d brought up an additional virtue—the absence of shaftlogs. The Seatorques, I’d observed, undoubtedly promised a bit of a reduction in drive-train upkeep, with no shaftlog-related shaft seals or packing to replace periodically, and no cutless bearings requiring periodic service either. Burkhardt had nodded and made one more point. I’d peered into the sump. All I could see down there was a 3,700-gph Rule bilge pump, one of three on board. Bone dry? The darn thing looked dusty! The other engineering details Burkhardt had commended while we’d pulled dipsticks and twisted pressure caps had been a tad less apparent than the Seatorque’s golden-hued thrust bearings, but they’d been equally revelatory. The athwartship fuel tanks, for example: There are two of them, and they’re sized identically, double-cross-connected, contiguous, all fiberglass (vinylester resin inside for smoothness, fire-retardant resin outside for safety), spotted near the Longitudinal Center of Gravity (to obviate fuel-burnoff-related trim issues), and secured immediately beyond the ER’s firewall to help suppress noise transmission forward. Each has a sump that maximizes fuel availability and facilitates drainage and, for safety’s sake, a solenoid-operated sight gauge that closes automatically when not in use. The savvy simplicity of the arrangement attests to some serious seafaring savvy—there’s no complex, potentially problematic fuel manifold to deal with, tank soundings are possible even if electronic sensors fail, and it’s possible to take on go-go juice, for either fuel tank, through port or starboard fill valves. Then there was the air-intake system. It originates with plenums along the underside of the cockpit caprails, well above the boat’s waterline. They feed air to the lazarette, a large, auxiliary-filled space with stoop-headroom just abaft the ER. And the lazarette, in turn, feeds air to the ER through vents that seal (both automatically and manually) should fire, a runaway diesel, or some other dicey issue obtrude. Will such a long and winding road diminish corrosive salt intrusion and keep the diesels happy? Absolutely. And finally, there were all the common-sense details. Headroom in the ER is just under 6 feet; fiberglass drip pans undergird the mains, the two, double-isolation-mounted Onan gensets, and the Hypro electro-hydraulic steering system’s mechanicals; onboard redundancies include two freshwater pumps, two Reverso oil-changers, two ABT Trac stabilizer pumps, and backups for the Glendinning EEC3 engine control, as well as the Hypro system; battery firepower is immense (the house bank consists of eight (eight!) 600-aH Lifeline AGMs); and lots of Soundown lead-foam insulation keeps life on board church-mouse quiet. Ah, yes. The Sharon Ann is now moving slowly south along a Palm Beachy stretch of the ICW, with the Sailfish Club and its paradisiacal burgers in the proverbial rearview mirror. 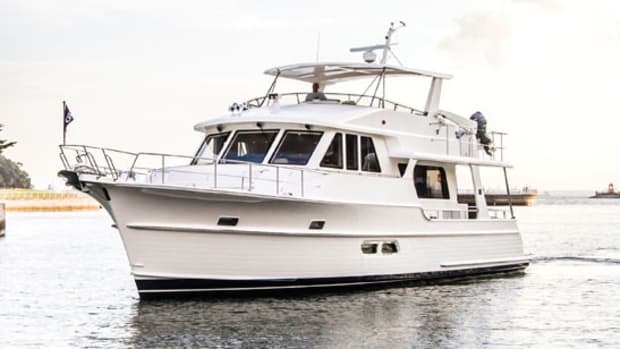 Burkhardt and I are enthusiastically trading sea stories in the boat’s pilothouse, undoubtedly encouraged by the gray-tinted, fixed side windows, the crisp, off-white Ultraleather headliner, and the teaky, teaky, teaky ambiance. 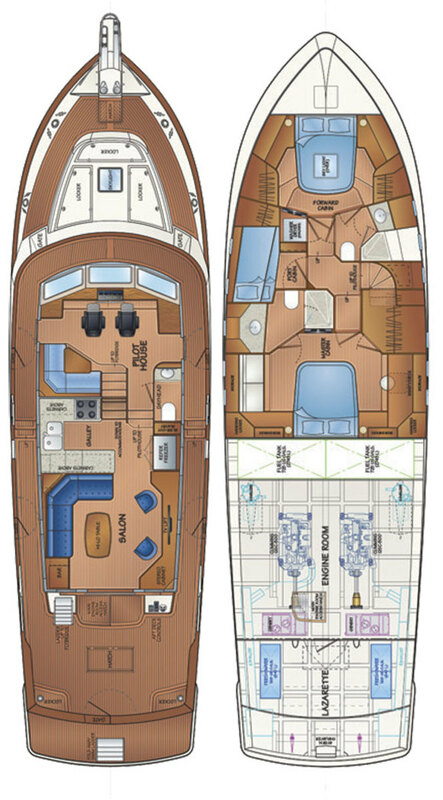 Interior arrangements around, behind, and beneath us represent what Fleming calls its “traditional layout,” meaning that on the main deck there’s a pilothouse forward, a saloon aft, and a galley in between. 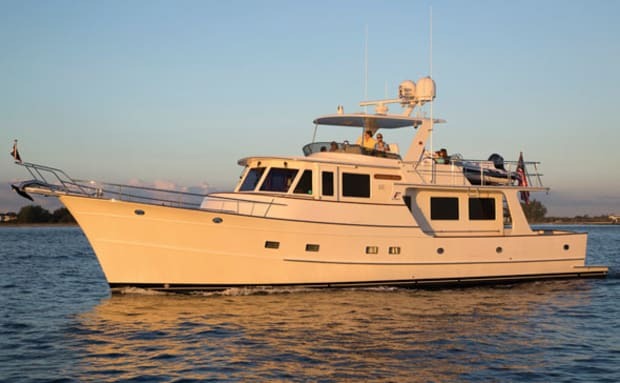 On the bottom deck, there’s a master forward (with an island queen and a shower-stall-equipped head to port); a VIP to port (with an island queen and access to a shower-stall-equipped dayhead to starboard); and a guest (with two up-and-over berths) just abaft the dayhead. 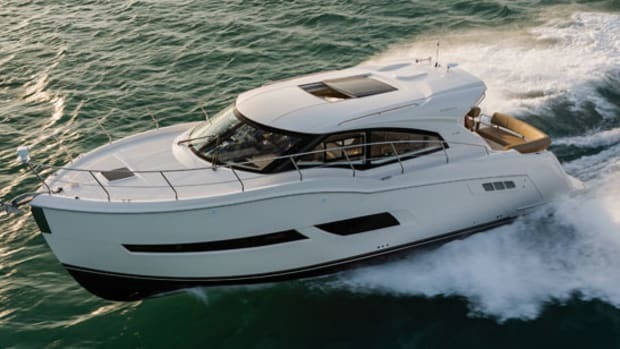 Finish is flawless throughout, with raised-panel cabinet and stateroom doors (some with radiused heads), Imtra lighting, and a cool Cruisair split-type air-conditioning system. Luckily, I already have my performance data in the bag at this point. 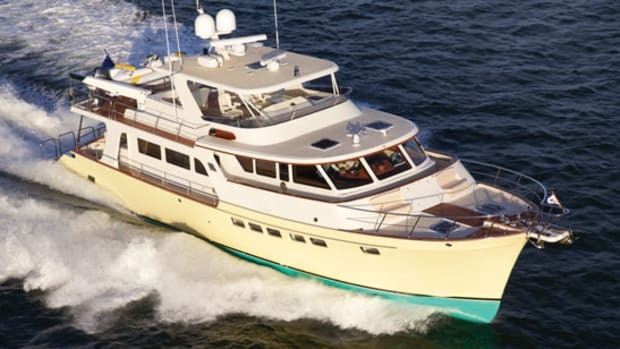 Top speed: 22.1 knots, which is pretty swift for a vessel with an 88,000-pound displacement, a solid-glass hull that’s reportedly 1¾ inches thick, and an immense load that includes everything from canned goods to a 12-foot AB Nautilus Yamaha-powered tender. Sound levels (at the lower helm): whispery, except at wide-open throttle. 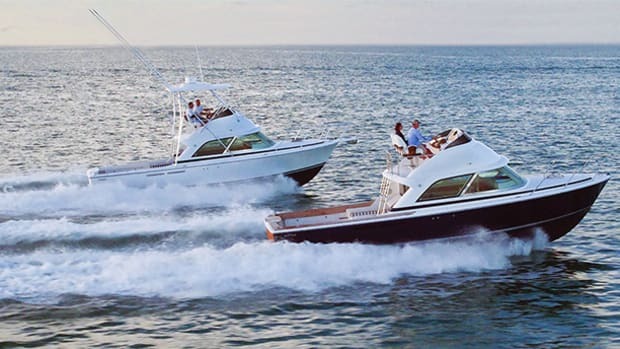 And handling (on a flat-calm sea): smooth and predictable, with arrow-straight tracking (thanks to a long, grounding-shoe-equipped keel that hangs down protectively below the props) and turns that are broad, slow, and slightly outboard-leaning, as befits a keel-equipped, straight-shot, twin-engine inboard vessel. When Flagler Memorial finally beckons, shadows are long and the sunlight golden. 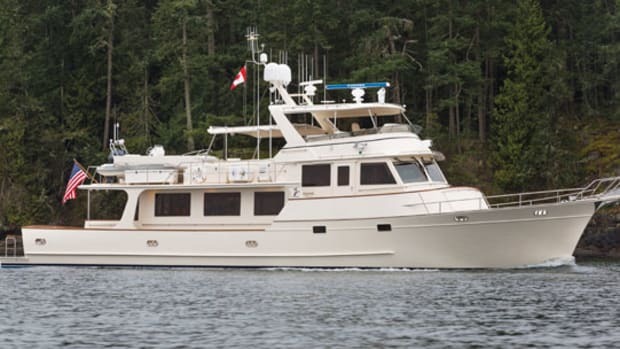 For the most part, Burkhardt retrieves his Ultra anchor (along with a snubber that comes standard with every Fleming) all by his lonesome, with an assist from his trusty Yacht Controller. The matter-of-factness of the procedure manifests a level of confidence that can only be earned over a lifetime. Yeah, Hemingway and Rybovich were true salts, each in his own way. But Burkhardt is, too. And so’s his boat. 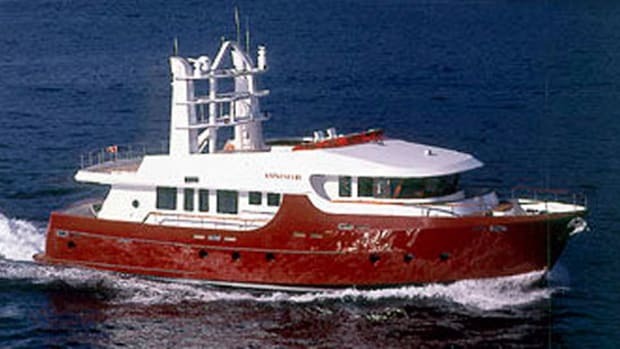 Click to see listings of Fleming Yachts currently for sale on BoatQuest.com. Air temperature: 78ºF; humidity 63%; seas: 1&apos; or less; wind: variable, light. 725 gal. fuel, 130 gal. water, 3 persons, 4,500 lb. gear.